3 Minutes at each station, no break for transition. Athletes will work together, to complete as many reps as possible within the three minutes at each station. One athlete working at a time. Each athlete must complete a minimum of one rep at each station. Movement Standards coming shortly... demo videos too! Both athletes will work individually during the 8 minutes to find their heaviest complex weight. Athletes will share one barbell. All teams will have the same amount of weight, to complete the complex. Athletes will put on and take off their own weights. Both athletes must complete the complex for their weight to count. Each weight will count towards their teams score. Athletes must successfully complete all 3 deadlifts + 2 hang cleans + 1 shoulder to overhead for weight to count. 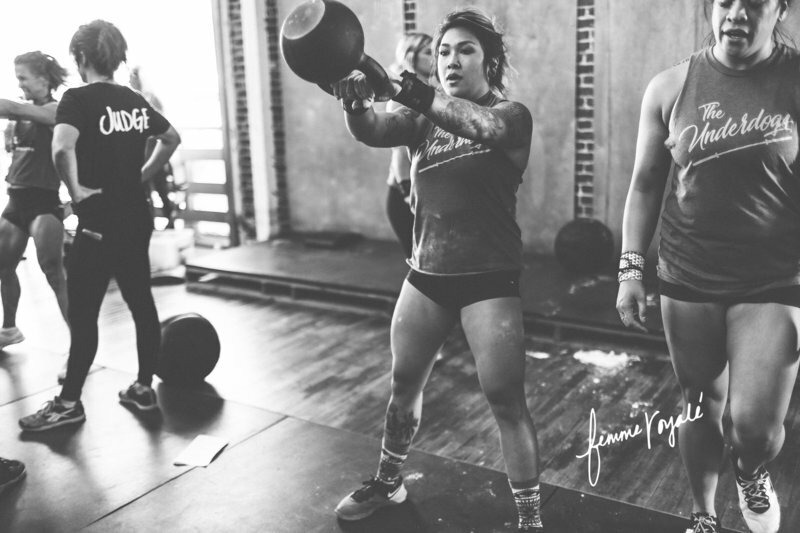 If the athlete drops the barbell, then they must start back at the beginning of the complex. 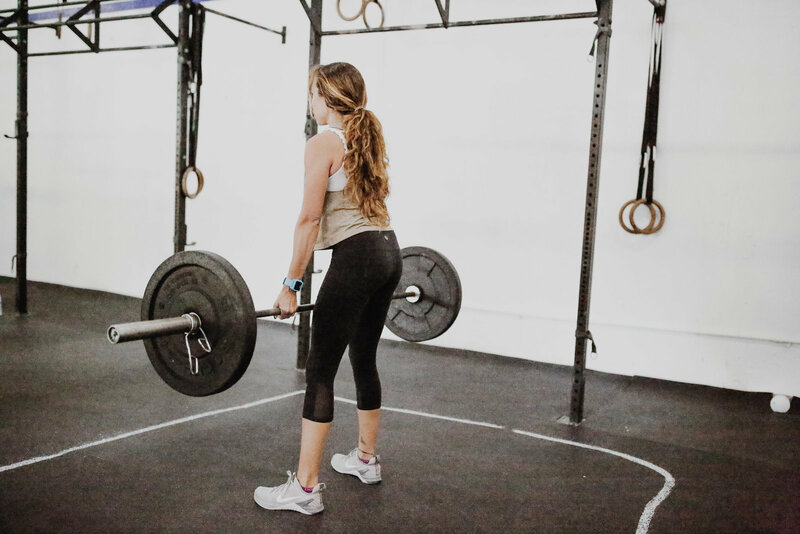 If athlete fails one of the reps, they can continue working as long as they don't let go of the barbell. Athletes will immediately into the second part of the workout. Both athletes will work individually during the 2 minutes to complete as many reps as possible. Movement Standards coming shortly.. demo videos too! We are excited to announce the Wisconsin Femme Royale Women's Competition. Don't miss out, this event will sell out! Our goal is to make sure we provide the safest environment and highest quality event coordination possible for all our athletes. If we must make changes or alterations to the workouts we will notify you immediately. • One person working at a time. • Each athlete must perform a min of one rep of each movement. 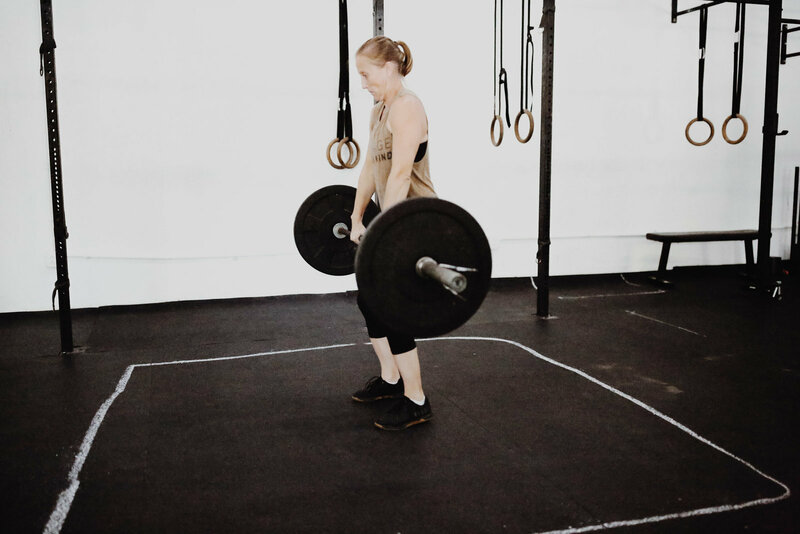 • Must complete two UNBROKEN Power Cleans. 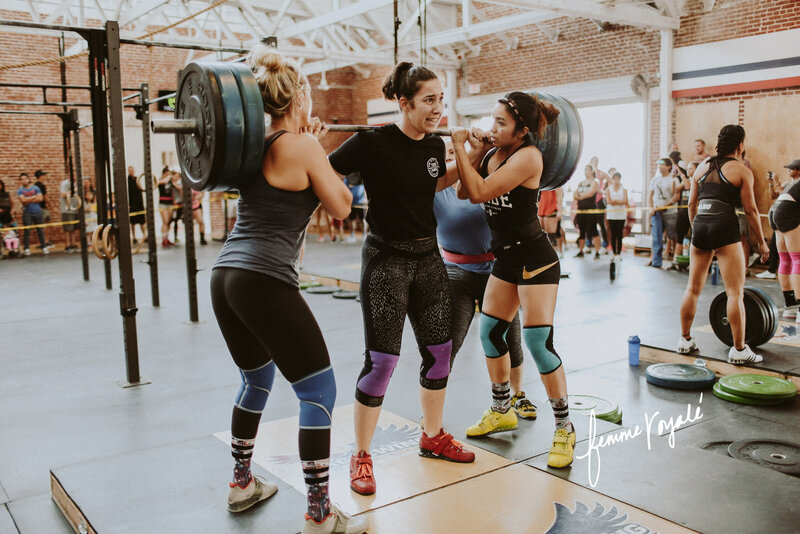 • If the athlete fails but catches the barbell without dropping they can continue working to complete the power cleans for 2 successful reps. Unlimited attempts allowed as long as barbell isn’t dropped. • Tap & Go -- no resting on the floor. Only in the hang or front rack position. • Athletes have the option to start at the 65 or 85 station without penalty. • The score will be the highest completed weight of each athletes combined. • Once the athlete fails, each athlete will attempt max effort deadlifts. This will be considered the tie break score. 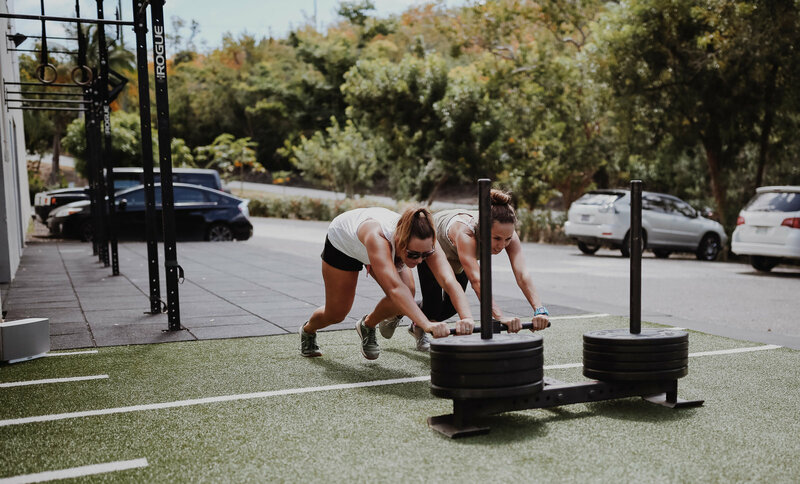 • One minute at each station for ladies to both complete the lift. If one fails the other will move on to the next station. 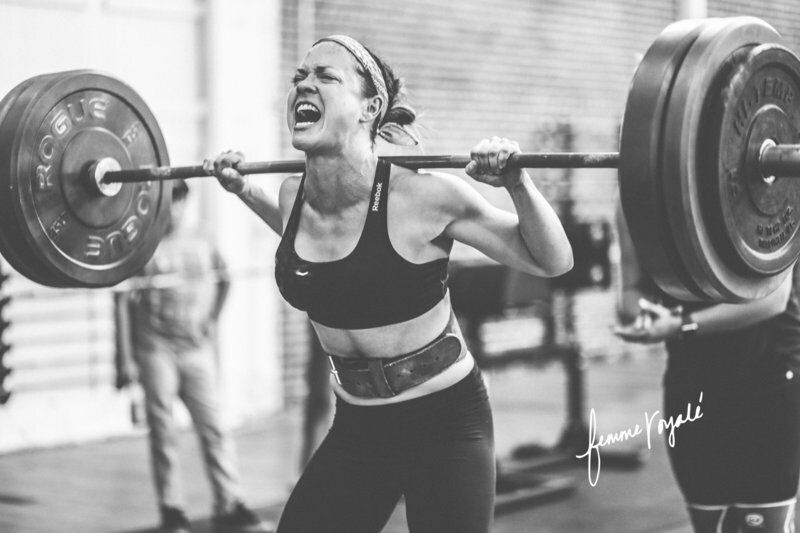 The athlete must perform two power cleans. Squat cleans are not allowed. Both power cleans must be pulled from the ground. They can not rest on the ground but in the hang position or the front rack. 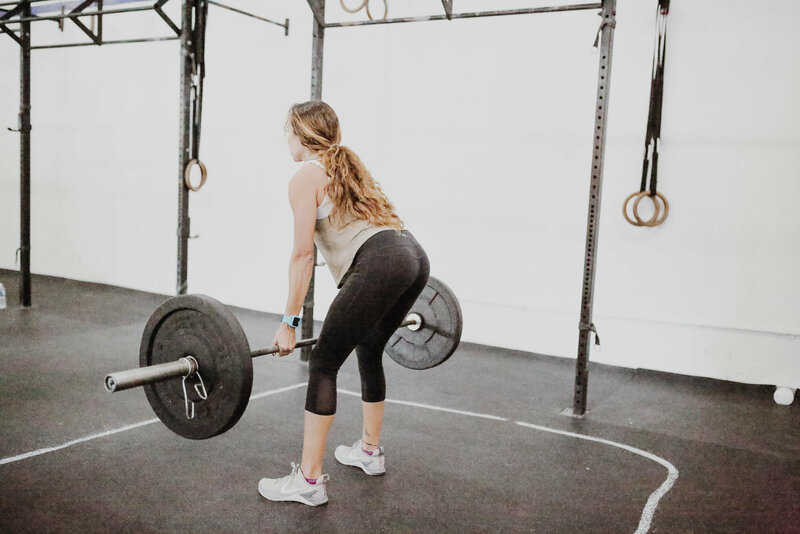 If you fail your second rep, you can attempt a third but you can not let go of the barbell and you must return back to the ground. In the remaining time max effort pull ups. 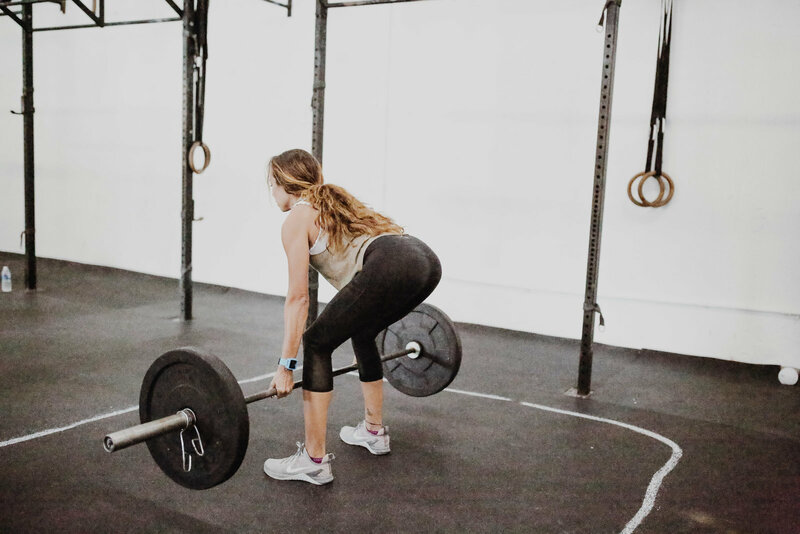 • Barbell weight will stay the same for all the movements. • One athlete working at a time on all the movements. 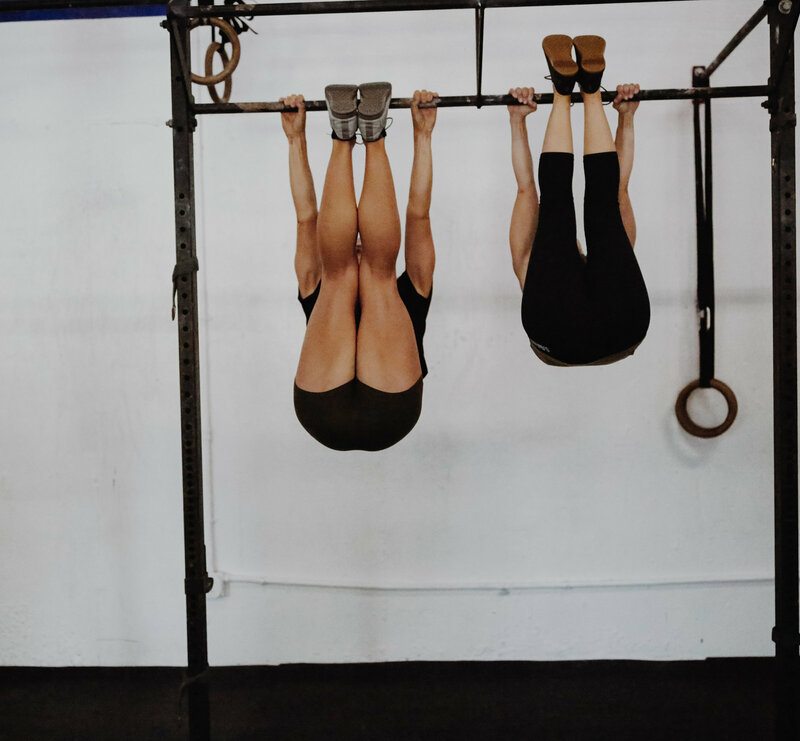 • Once the workout is completed, the athletes will work together to complete as many pull ups as possible in the remaining time of the 15 min. • If the athletes finish the workout in 13:30, they will have 90 sec. of max effort pull ups. • 50/50 & RX divisions: athletes will have the option to complete 2 movements, the more advanced movement will be worth 3 pts. Want to download the workout? Click here! This Workout will be completed in Pairs. Athlete A & B are 1 Pair and Athlete C & D are 1 Pair. At the call of 3-2-1, Go, Athlete A & B run out onto the floor. They must complete a COMBINED 42 Pull Ups. While one athlete is working the other athlete must hold their Dumbbell locked out overhead. 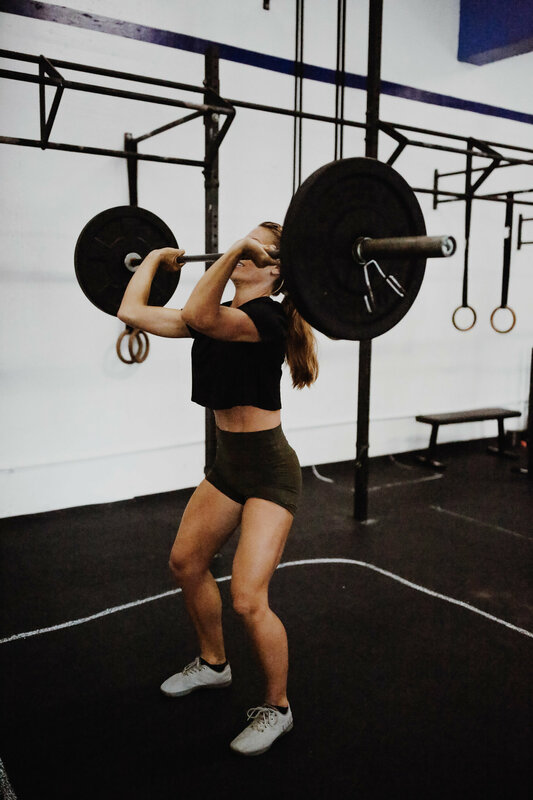 The athlete can’t start their pull ups until the dumbbell is locked out and if at any time the dumbbell drops below the head, no repetitions will be counted until the dumbbell is back to lockout. The Pair may break up their reps however they want but each athlete must complete at least 1 repetition. 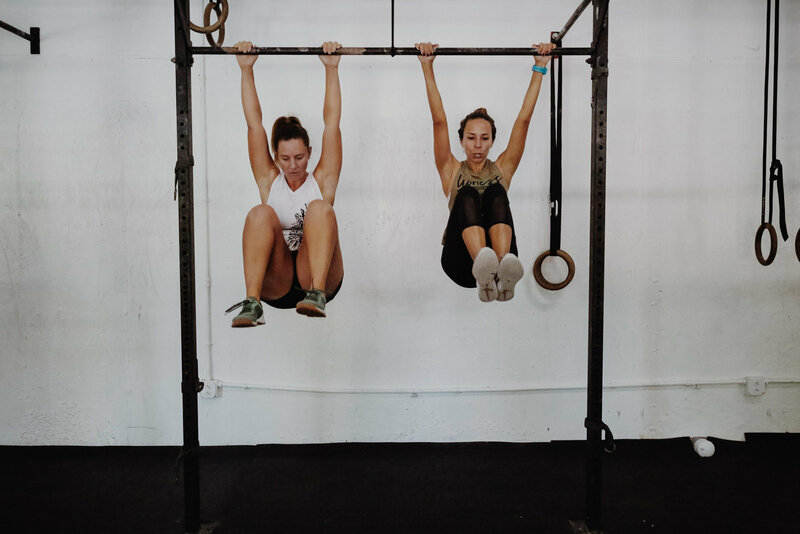 Once Athlete A & B complete a COMBINED 42 Pull Ups, they will then complete a COMBINED 42 Single Arm DB Thrusters. 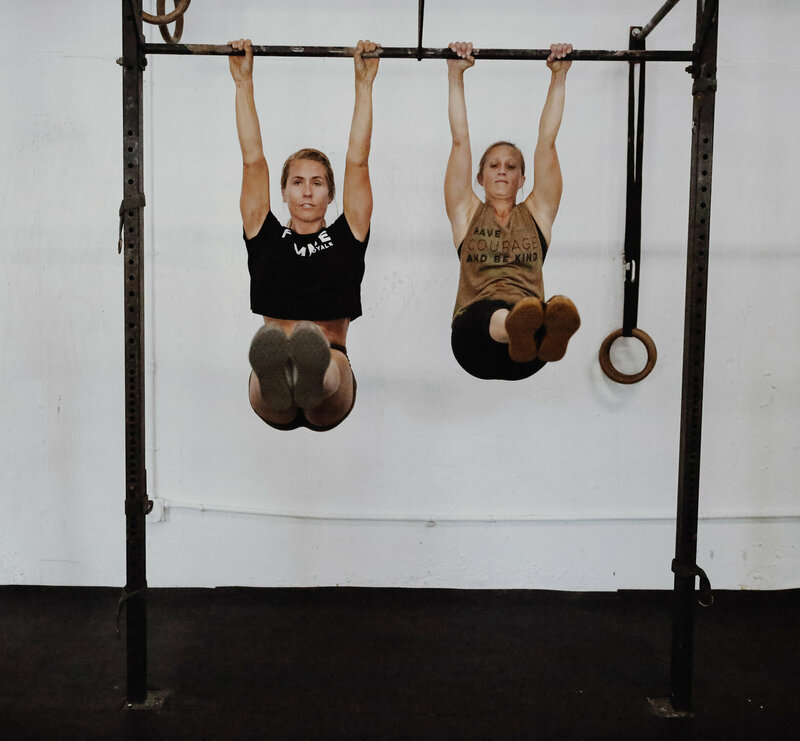 While one athlete is working the other athlete must hang from the pull up bar. If at any time the athlete drops from the pull up bar, no repetitions may be counted until the athlete is back up. 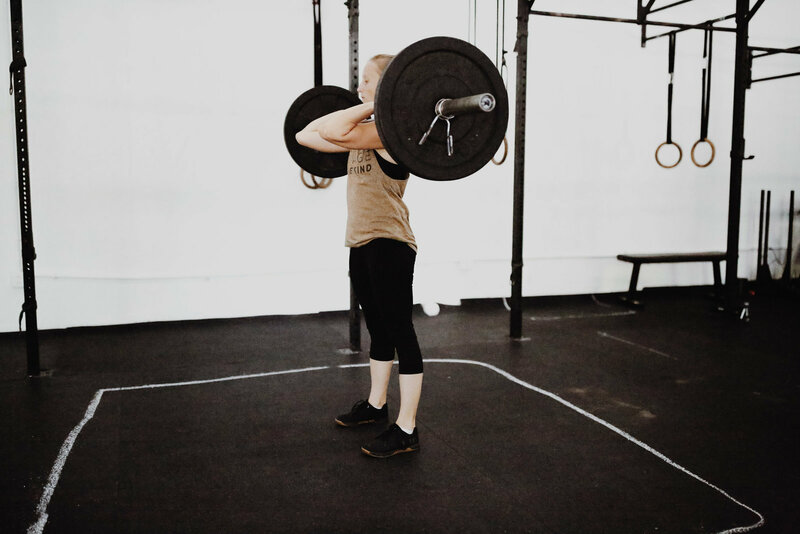 For the Single Arm DB Thrusters, you can switch arms whenever you want. The Pair may break up their reps however they want but each athlete must complete at least 1 repetition. 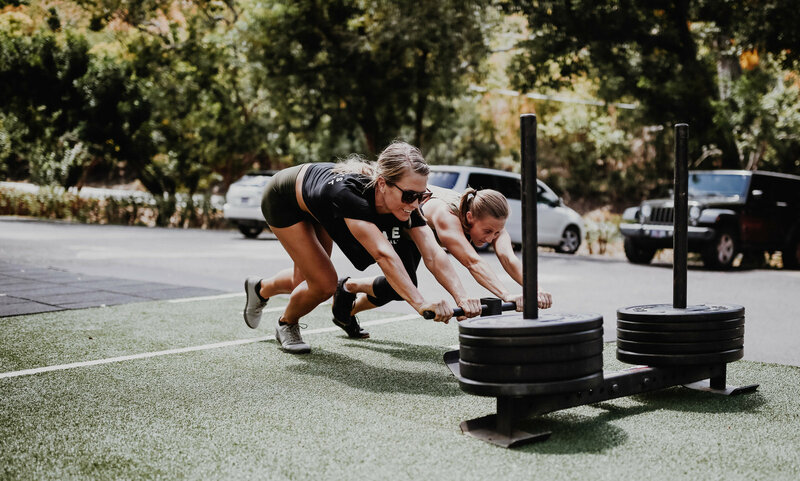 Once Athlete A & B complete their 42 Pull Ups and 42 SA DB Thrusters, they will run to their start PAD to tag Athlete C & D who will go out and complete their combined 42 Pull Ups and 42 SA DB Thrusters in the same fashion. The pairs will go back and forth with 30 Pull Ups and 30 SA DB Thrusters and then 18 Pull Ups and 18 SA DB Thrusters in the same. Once Athletes C & D complete their 18 repetitions of SA DB Thrusters, they will run back to their start pad where time will be called. Once all four athletes have completed their round. This will be a relay style workouts. This will be 2 scored workouts. 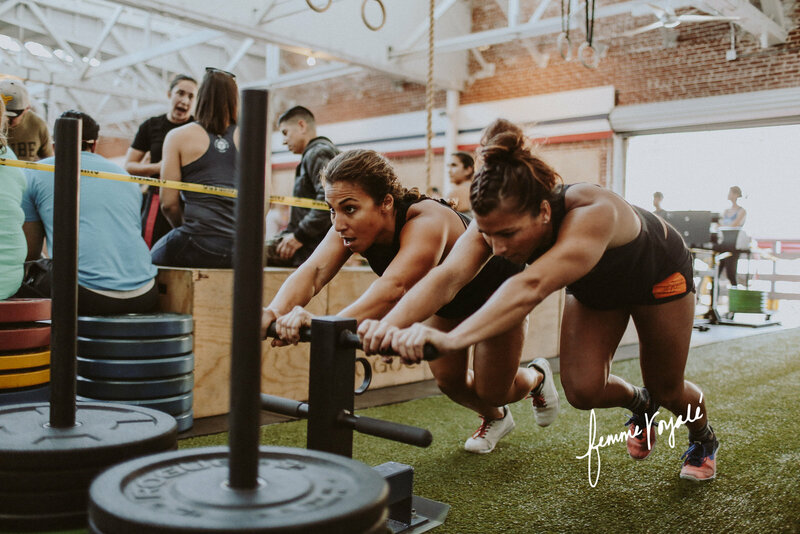 At the call of 3-2-1 Go, Athlete A will run out to the floor and complete their 50 Double Unders, 25 Deadlifts and 15 Burpee Over Bar. Once complete Athlete A will run back and tag Athlete B who will run out and complete their 3 exercises. This will continue in that fashion for Athlete C & Athlete D.
Once all members get back to their start pad time will be called. 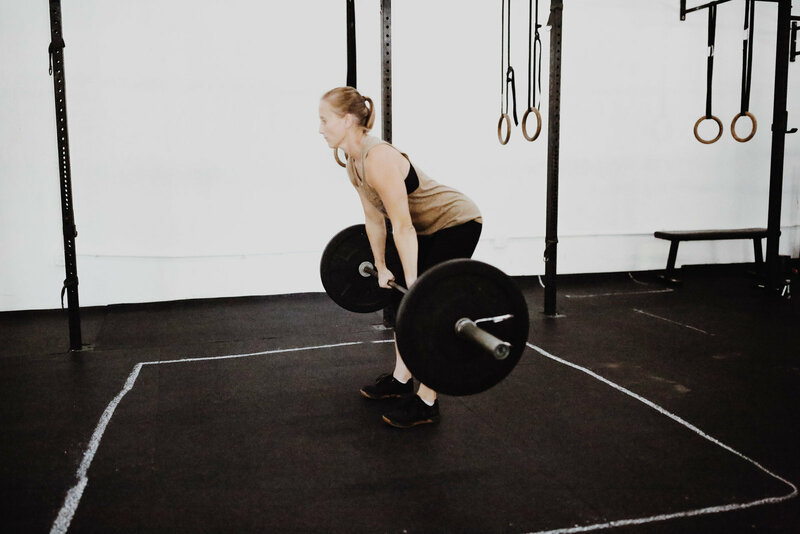 If you finish under the time cap, your team will complete as many Deadlifts as possible until the 11 minute time cap is called. Only 1 Athlete may be on the floor at a time, and you may run back and tag your teammates whenever you would like. Your team’s score for workout IIA will be the number of deadlifts you complete once workout II is complete. One athlete always rowing for max effort meters within the entire 15 minute time cap. 500m increments. At the call of 3-2-1 Go, Athlete A will run out to their medicine ball and complete as many UNBROKEN Wall Balls as they can, once the ball drops they must run back to start pad and tag Athlete B. Athlete B will then run out and complete as many UNBROKEN Wall Balls as they can, once they break, they must run back and tag Athlete C. It will continue in this fashion until the team gets 80 repetitions. Once all Wall Balls are complete, the team will complete 80 Toes to Bar, 80 Hang Power Cleans, and 100 Box Jumps in the same fashion. Once an athletes starts a repetition, they must complete the repetitions UNBROKEN. If they ever break or fall off the pull ups bar, they must stop run back to their start pad and tag the next athlete. If you finish under the time cap, your team will still be rowing until time is called. There will be 2 scores for this workout. The time it takes to complete all 100 repetitions of the 4 movements and the # of meters on the rower at the end of 15 minutes. Each team will have a rower. 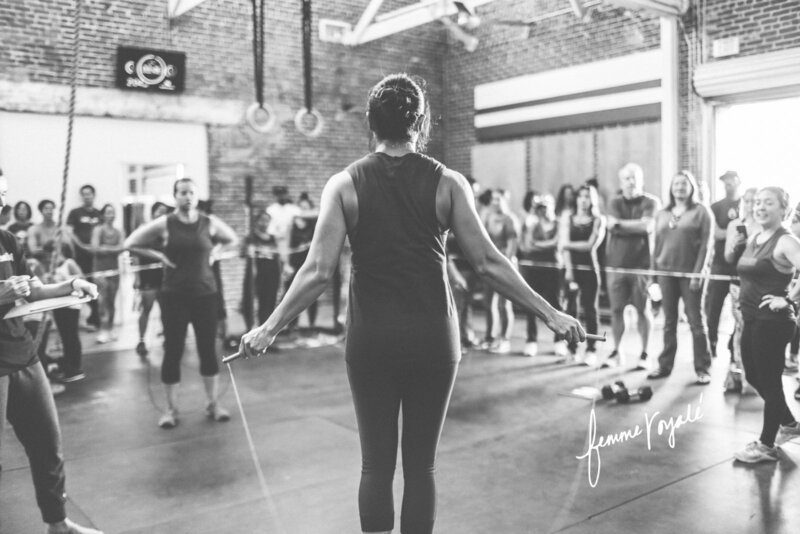 One team member will always be rowing once the workout starts. 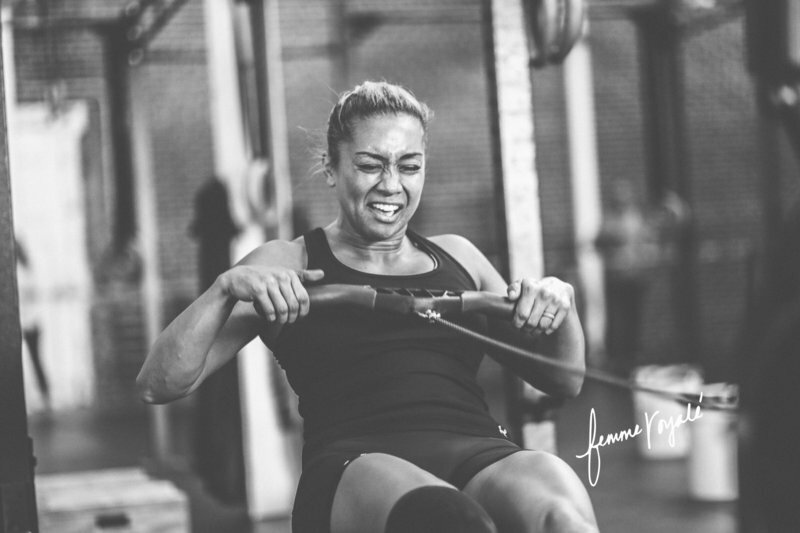 Each athlete MUST row in 500m increments. Once the athlete hits 500m, they must switch out with another teammate. This will be a scored portion of the workout. Each team member must row at least one time. 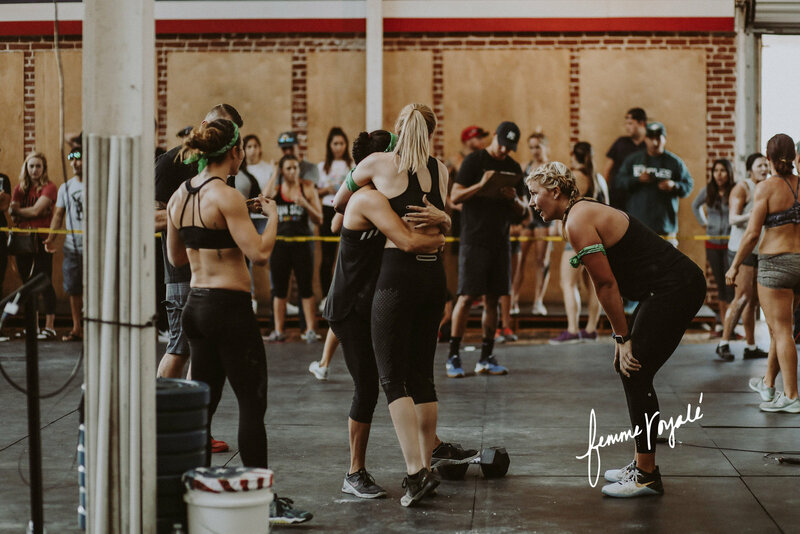 Our goal is to bring women together through competition to encourage, empower and support one another. Our competitions will help over come limiting beliefs, break through mental limitation and build a stronger self confidence. 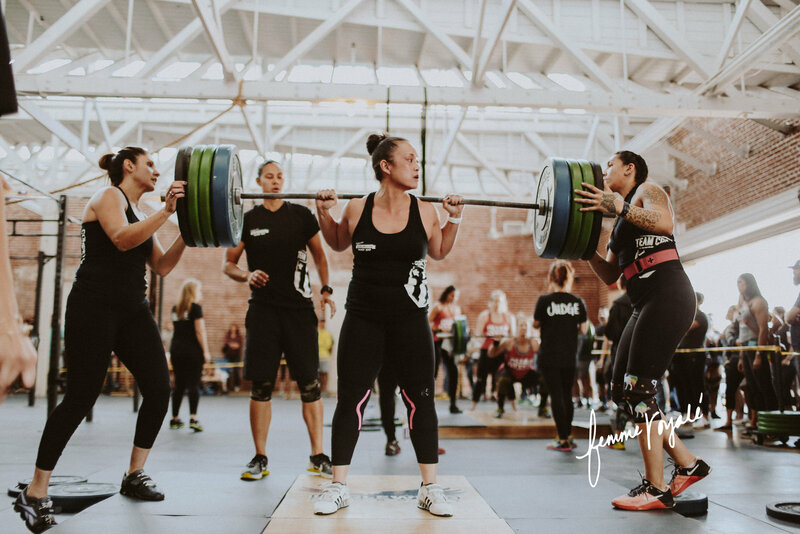 ​This event is for ALL fitness levels, competitive females, as well as novice athletes looking to try their very first competition. 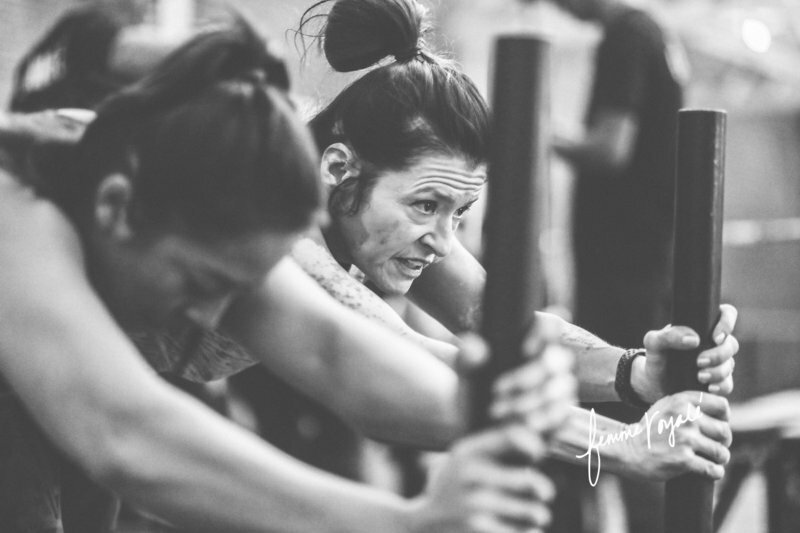 As a team of 4 the ladies will work together to complete 3 workouts throughout the day. The top five will advance to the finale. We are excited to announce the first Femme Royale Women's Competition of 2019. Celebrating Mother's on their special weekend and making memories with our favorite Lionesses. with new entrances, restrooms, & beautiful remodeled. 2 Partners will be working to complete as many reps as possible while 2 partners are holding a static hold. Partners must be in static hold position for the dynamic movements reps to count. **Except for the AirDyne, one partner will be resting, one working, and two athletes in the static hold position. Partners can rotate movements however you choose. Athletes are NOT required to complete all the movements. If you switch or rotate partners the athletes working MUST stop. Communication is KEY. 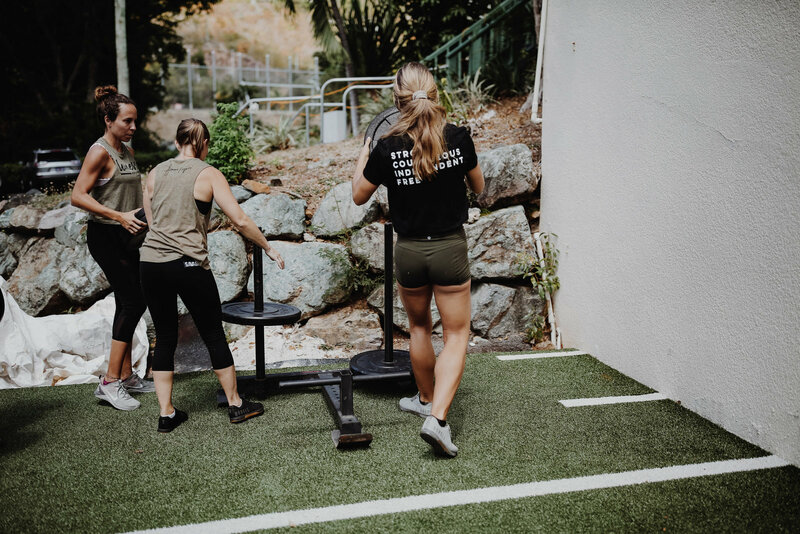 This workout is about strategy and working together as a team. It is entirely up to you on how you divide up the movements and who does what at what stations. RX Unison T2B > Partners must be working in unison for the rep to count. The starting position both feet must begin behind the bar (vertical plane) at the bottom, and arms fully locked out. Feet must touch the bar at the top at the same time. Toes must touch between hands. The athlete’s rep will count once both athletes have touched the bar. 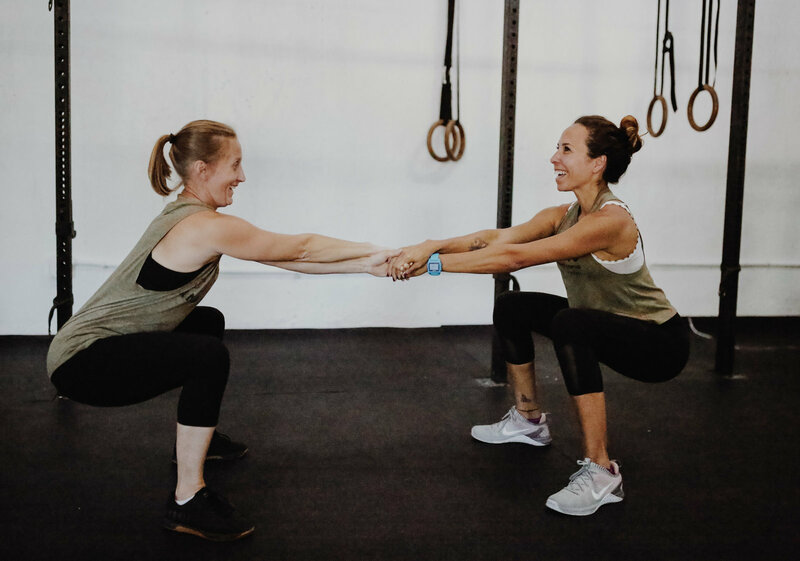 RX Partner Pistol Hold > Two athletes must hold the bottom of a pistol squat in order for the unison T2B reps to be counted. Two athletes will lock hands and hold the bottom of a single leg squat. The leg extended must remain off the ground, during the hold. Both athletes will have either their right leg extended during the hold, or both of their left legs extended. Athletes may not have one right, one left leg extended. Their hips must below parallel for the hold to count. FUN Unison Hanging Knee Raises > Partners must be working in unison for reps to count. Feet must begin behind the bar (vertical plane) at the bottom, and arms fully locked out. Knees must break hip crease. Rep will be counted once both athlete’s knees have reached higher than their hip crease. 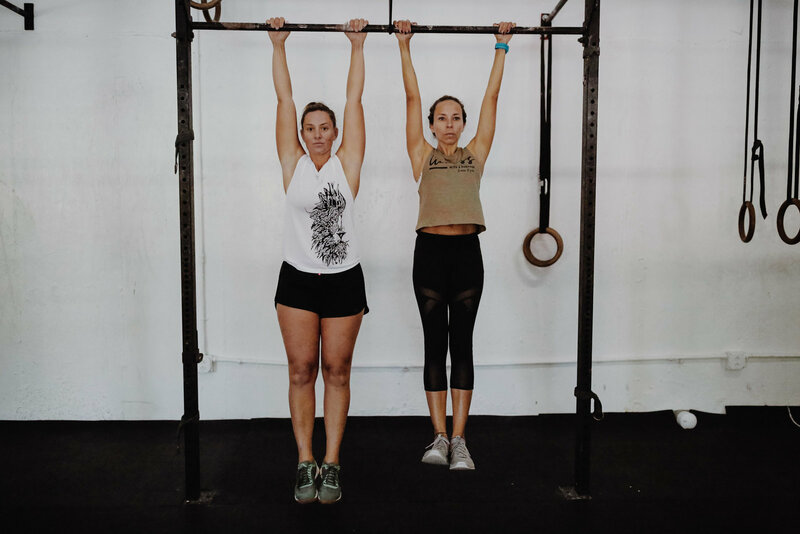 FUN Partner Squat Hold > Two athletes must hold the bottom of a squat in order for the unison hanging knee raises reps to be counted. Two athletes will lock hands and hold the bottom of a squat. Both athlete’s hips must below parallel for the hold to count. Airdyne > no explanation needed! You know what to do! Rest > Rest, no need to say more. 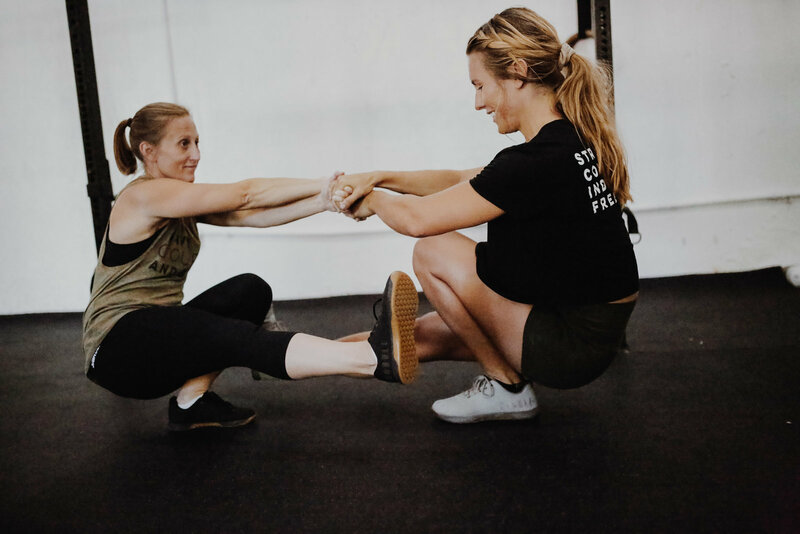 RX Partner Opposite Arm & Leg Plank Hold > While one partner is airdynin’ and the other is resting, two partners will be holding an opposite arm & leg plank hold together. Both athletes will have either their right or left arm locked onto the opposite athlete’s shoulder. If the right arm is extended, their left leg must be off the ground. If their left arm is extended their right leg must be off the ground. If you switch or rotate partners the athlete on the bike MUST stop. Communication is KEY. 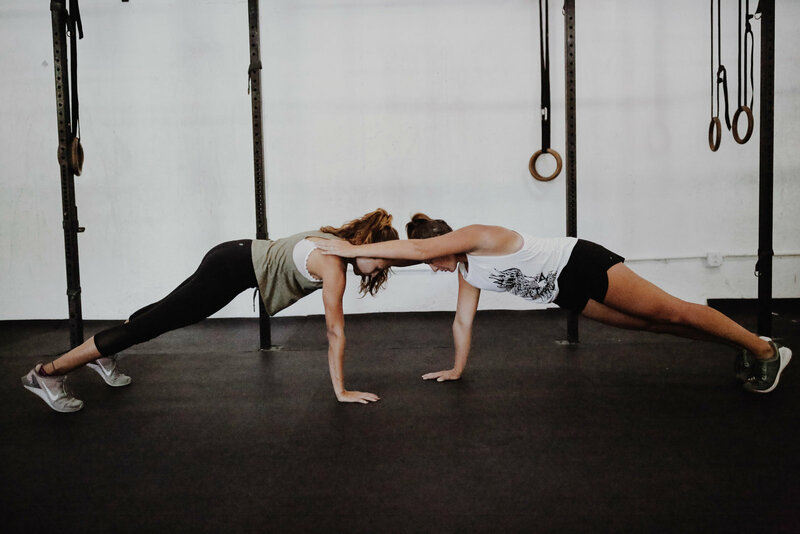 FUN Partner Plank Hold > While one partner is airdynin’, and the other is resting, two partners will be holding a plank hold. Two partners will start in the plank position, arms locked out and knees off the ground. From there one athlete will rest her hand on top of the other athlete’s shoulder. The other athlete will do the same. The hand that is holding the athlete up is the shoulder the other athlete will rest their hand. Both athletes will either have their right arms locked or their left arms locked. Two athletes will be holding an inverted pike position on the box while two athletes will be completing box step overs. The athletes MUST be inverted for the other athlete’s step overs to be counted. Athletes will start on one side of the box and step on top of the box, to get to the other side. Hips do NOT need to be extended on top of the box for the rep to count. After the athletes step off the box they must then return to the otherside of the box by going under the athletes holding the inverted pike. The rep is counted after the go under the inverted athlete. Inverted Pike Position > Each athlete has to have both feet on the box and both hands on the ground. We understand that different shapes and sizes of athletes will make for a variety of ways to hold this position. You will also need to figure out the distance of your feet and hands on the box to ensure that your partners can crawl underneath you. 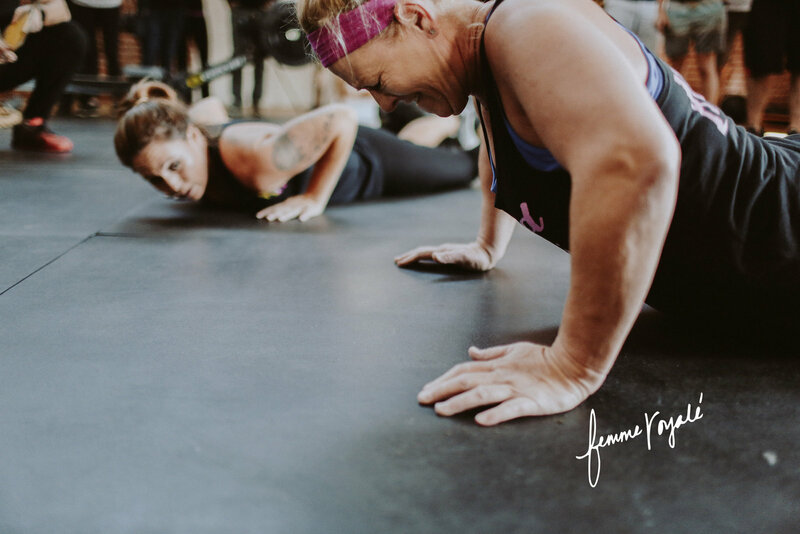 24” Box Step Overs w/ London Bridge > Two athletes will be holding a plank position on the box while two athletes will be completing box step overs. The athletes MUST be holding a plank for the other athlete’s step overs to be counted. Athletes will start on one side of the box and step on top of the box, to get to the other side. Hips do NOT need to be extended on top of the box for the rep to count. After the athletes step off the box they must then return to the otherside of the box by going under the athletes holding the plank. 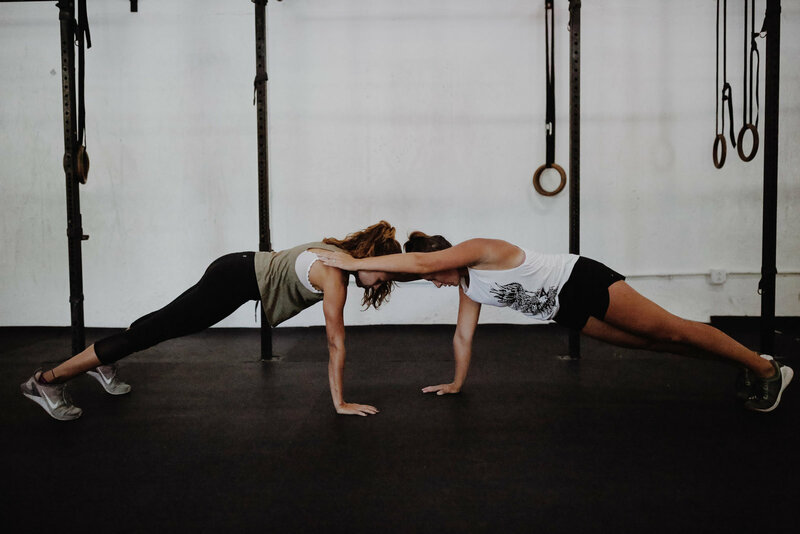 The rep is counted after the athlete goes under the other athlete holding the plank. All four athletes will work together to complete the med ball passes. RX > Two burpee plenty if the ball is dropped or if any of the athlete’s feet touch the ground during the passes. 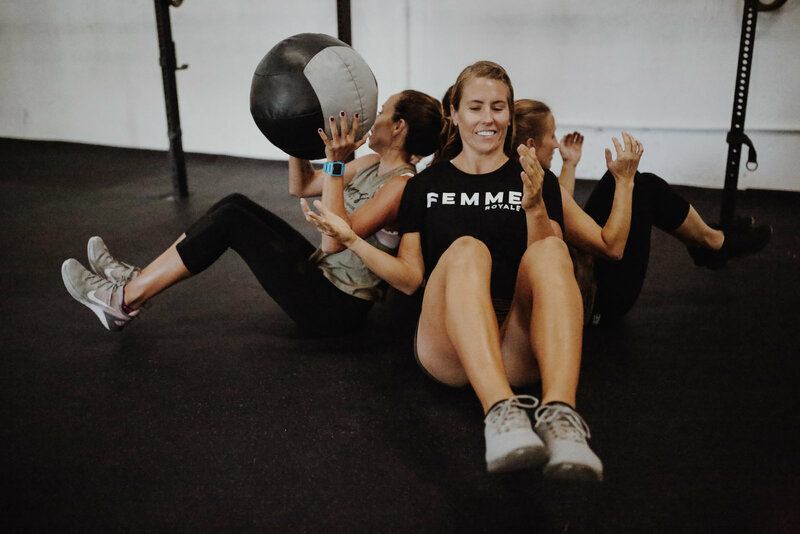 FUN > Two burpee plenty if the ball is dropped or if the athlete receiving the med ball’s feet touch the ground during the passes. 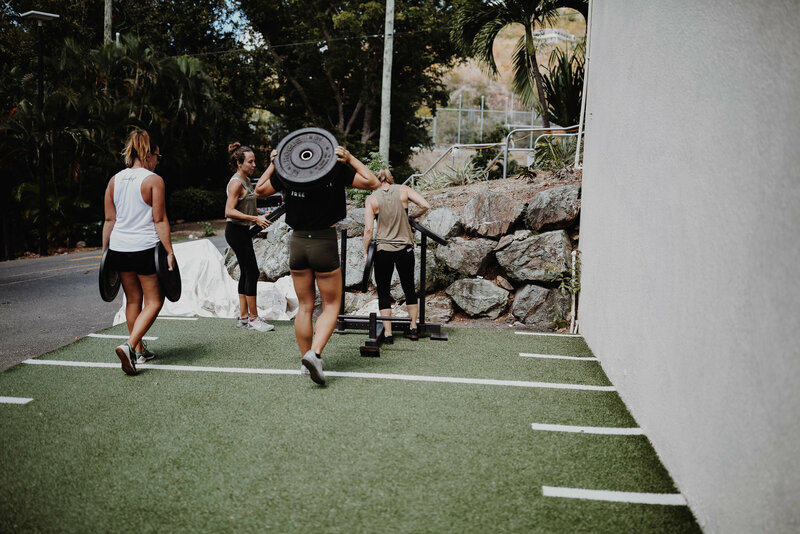 Once the passes are completed the athletes will then work to complete all the barbell and med ball sit up reps.
One athlete will be working to complete the barbell reps, one will be resting, while the two others will be working on completing all the med ball sit ups. Athletes must complete the barbell movements in the order listed above. All athletes must do a minimum of one rep per each of the movements. Once the athletes have completed all the barbell & med ball sit ups the athletes will work to complete their 80 med ball passes. If the athletes do not finish within the time cap of 18 minutes, their score will be the amount of reps completed. 1 Pass = 1 Rep.
RX MedBall Pass > All four athletes will sit shoulder to shoulder facing out with their feet off the ground. Athletes will work together to pass the med ball one direction 40 times, and then again in the opposite direction for another 40 times. All athlete’s feet must remain off the ground while passing the med ball. If an athlete’s feet touch the ground, or the ball is dropped there will be a two burpee plenty. 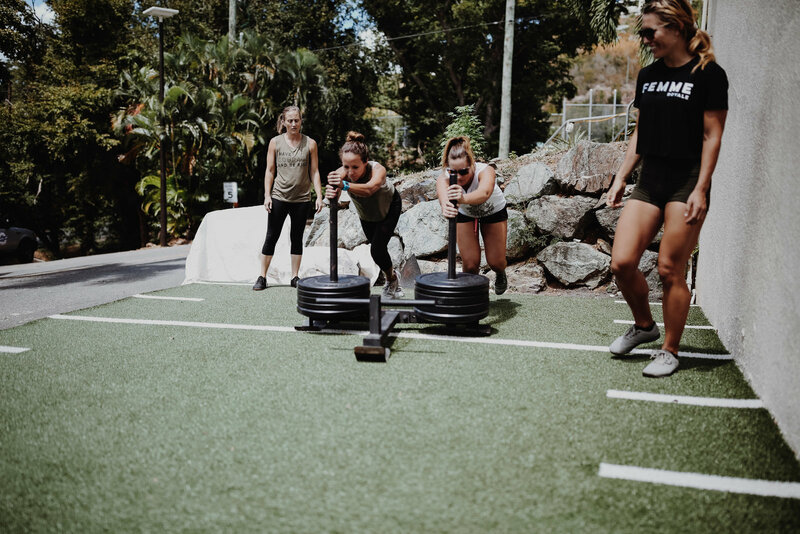 All four athletes must stop and complete two burpees, once the burpees are complete they can then resume where they left off on their passes. 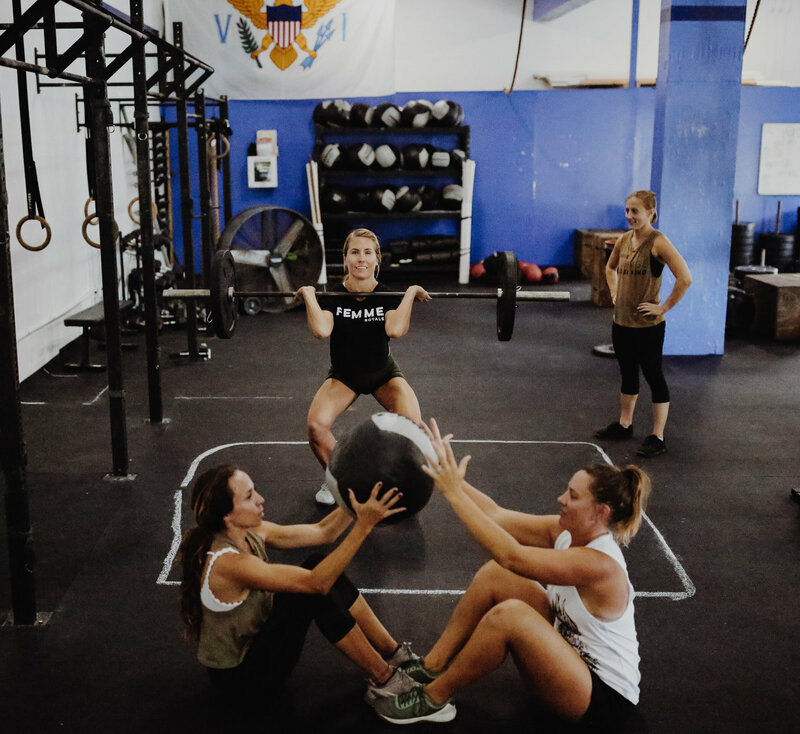 Once all 80 passes are complete they can move onto the platform and start completing their barbell and sit up reps.
FUN MedBall Pass > All four athletes will sit shoulder to shoulder facing out with their feet off the ground. Athletes will work together to pass the med ball one direction 40 times, and then again in the opposite direction for another 40 times. Only the athlete receiving the med ball feet need to be off the ground. If the athlete’s feet touch the ground while receive the medball, or the med ball is dropped there will be a two burpee plenty. 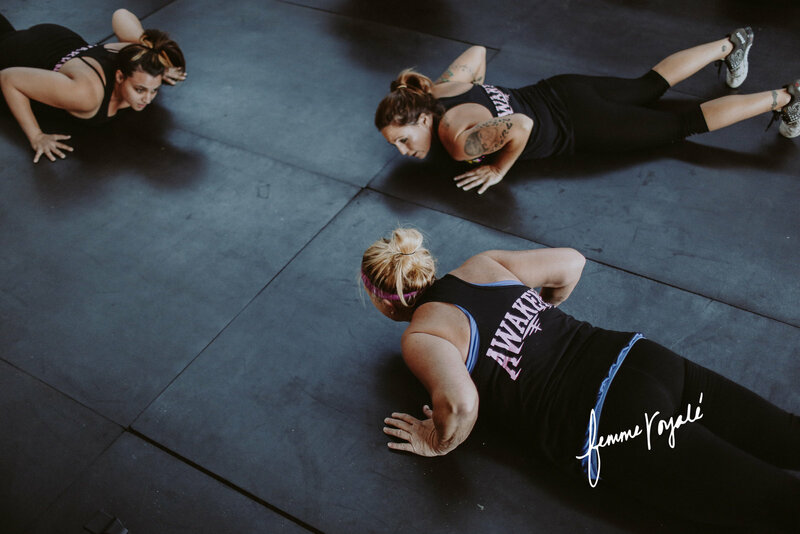 All four athletes must stop and complete 2 burpees, once the burpees are complete they can then resume where they left off on their passes. 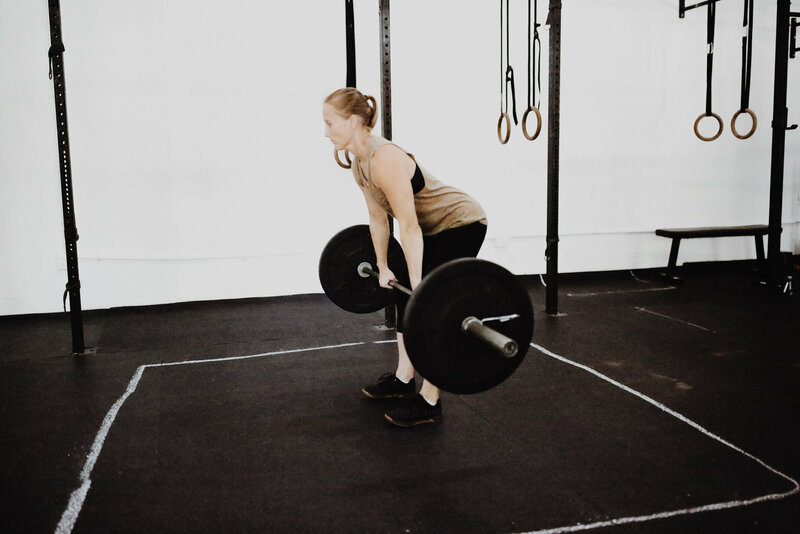 Once all 80 passes are complete they can move onto the platform and start completing their barbell and sit up reps.
Thruster > The barbell will start in the front rack position, the athlete must then squat below parallel (hips below the knee cease). 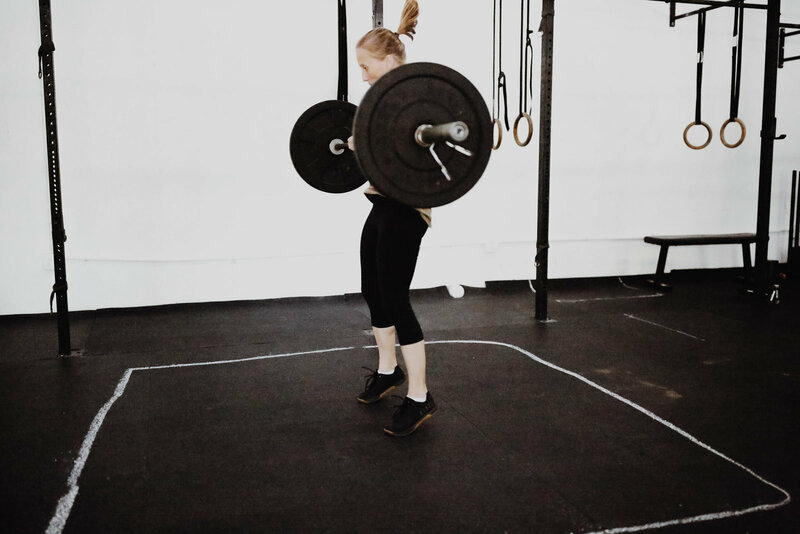 In a thrusting motion the athlete will drive the barbell overhead. 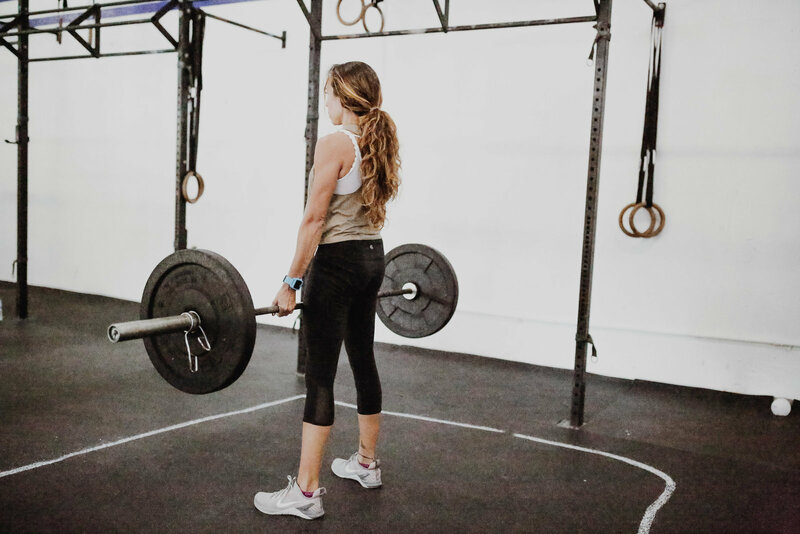 The rep is counted with the athlete is fully locked out; arms, knees, hips fully extended and barbell over the middle of the body. 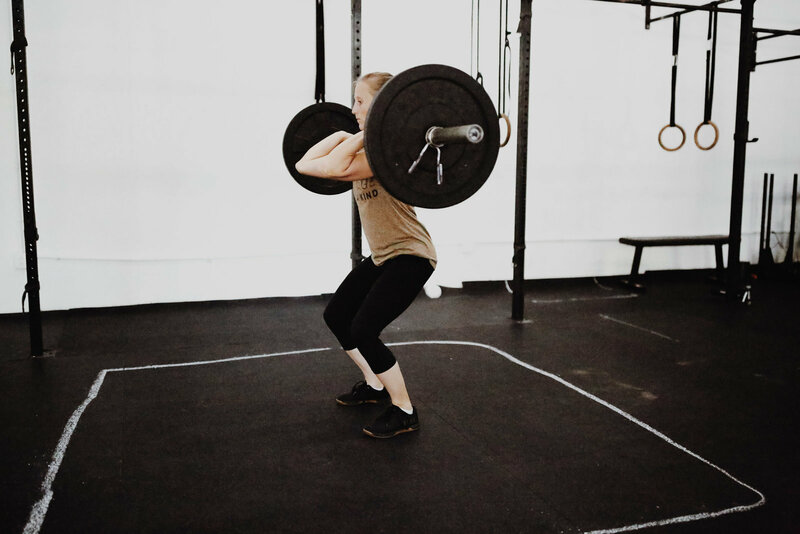 The thruster is one fluid motion, no jerking or pausing at the shoulder. Deadlift > Athlete must begin with the barbell on the ground. 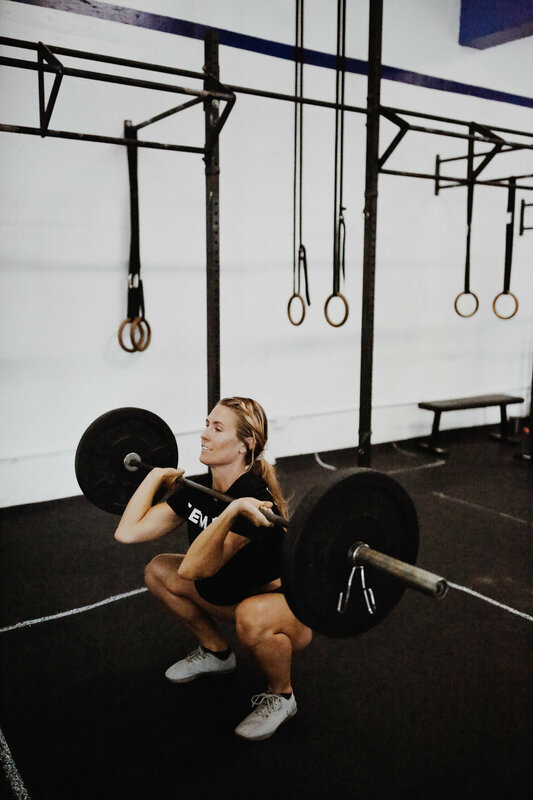 Athlete will elevate the barbell from the ground and return it to a fully standing position with hips fully open, knees fully locked out and shoulders behind the vertical plane of the barbell. 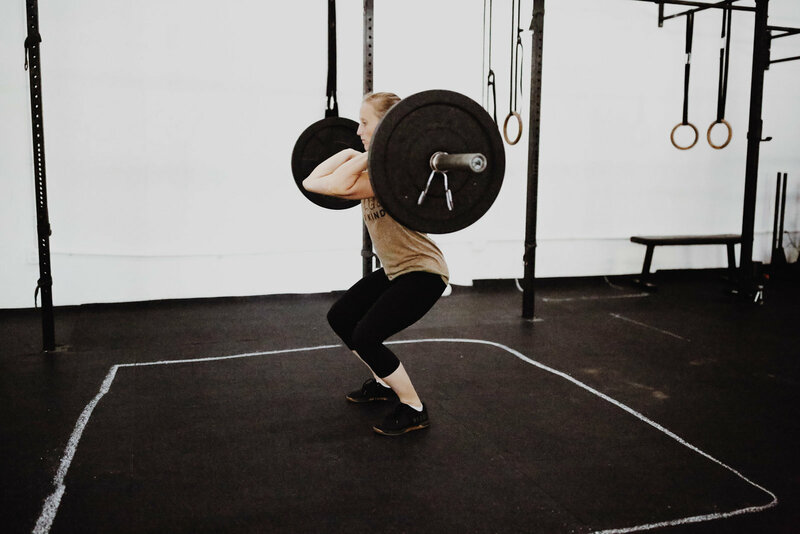 Hang Power Clean > The athlete’s starting position is with the barbell above the knee. Finishing position is barbell in the front rack position, hips and knees fully extended. The athlete may NOT squat clean the reps, nor pull from the floor. 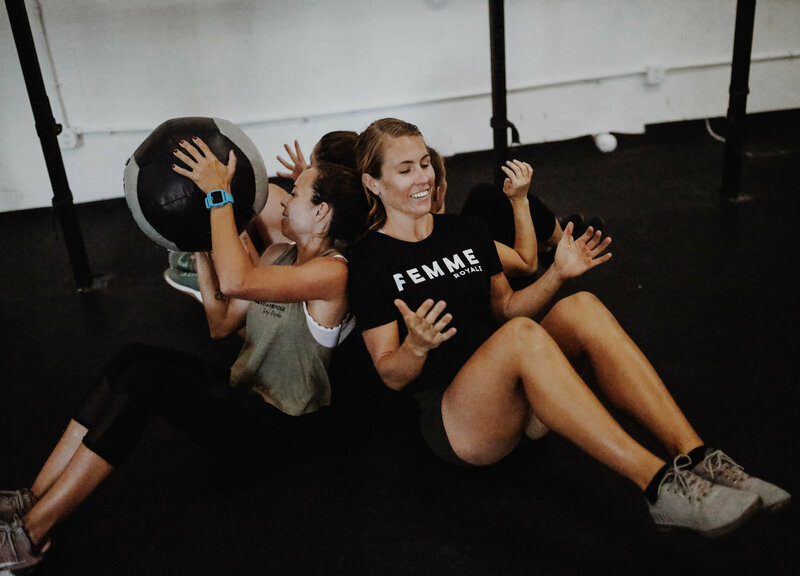 Partner Med Ball Sit Ups > Two athletes will lock or touch feet while laying on their back. One athlete will then descend with the med ball and touch the ground with the med ball behind their head. 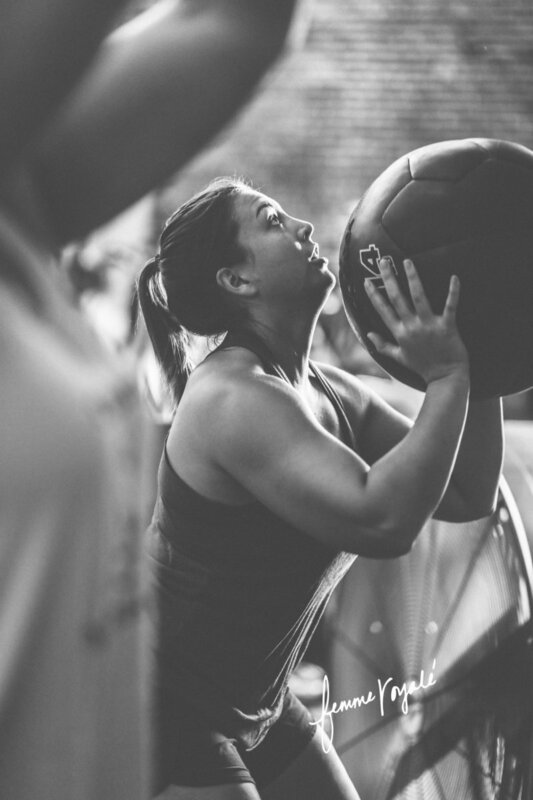 The athlete will then return to a seated upright position and pass the med ball to the partnering athlete. That athlete will then descend with the med ball and touch the ground with the med ball behind their head. 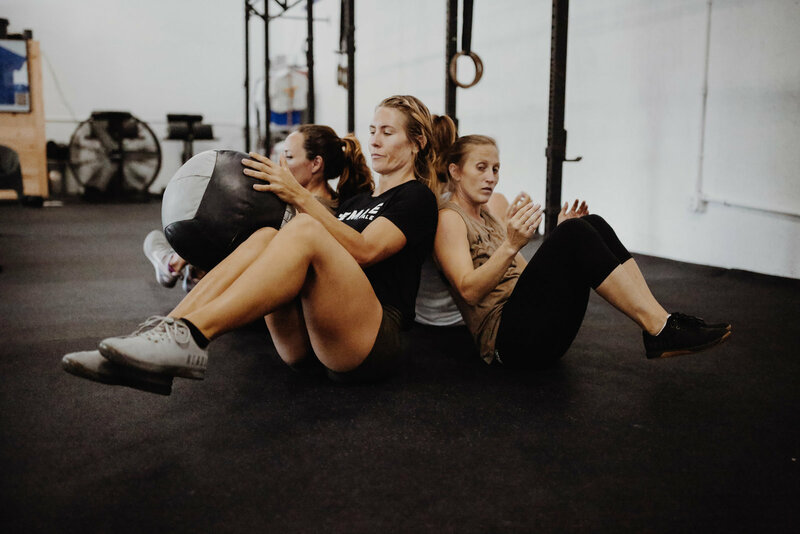 The athlete without the med ball does not have to complete a sit up. Only the athlete with the ball will complete a sit up. The rep will be counted once the athlete has touched the ball to the ground and passed it to the next athlete. All for athletes will start at one end with weights. As a team the athletes must carry down their weights to the sled. 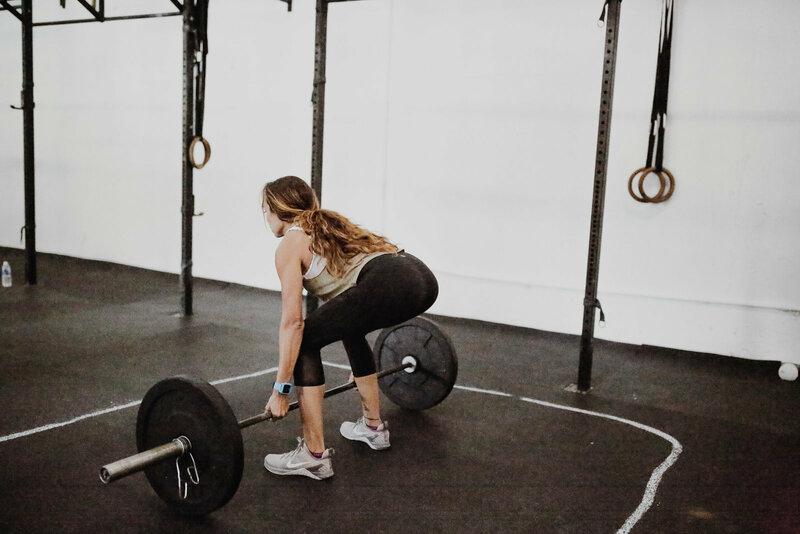 Athletes may only carry two weights at a time. 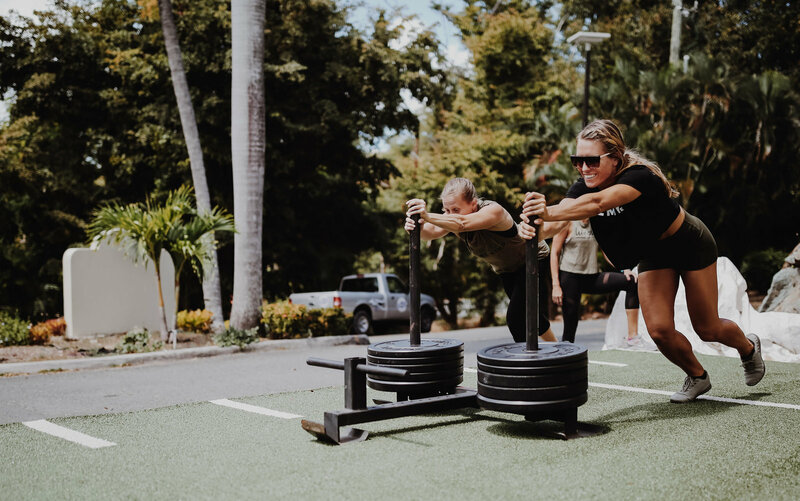 Once all the weight is on the sled, the athletes will then work together to complete as many sled pushes possible within the remaining time. Only two girls pushing the sled at a time. You can rotate partners. Each girl must do at least one sled push. 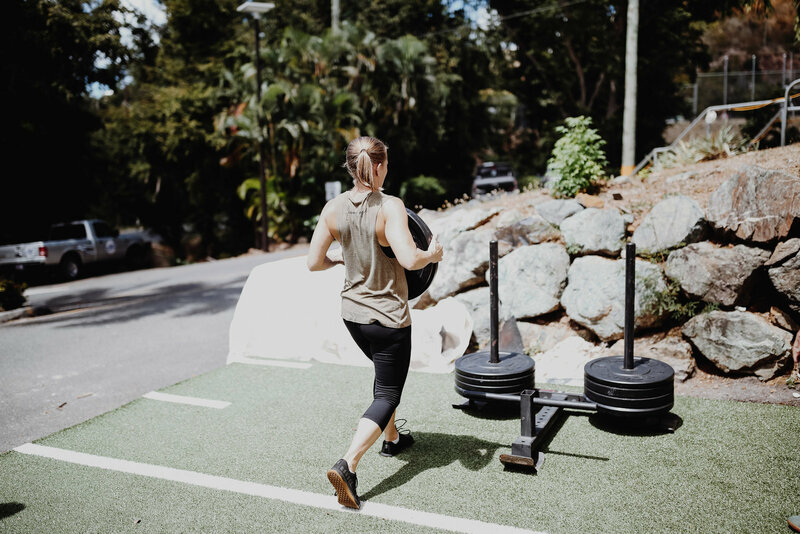 Length of sled push approx 100ft = 1 rep.
Each 25ft will be worth .25 of a point. 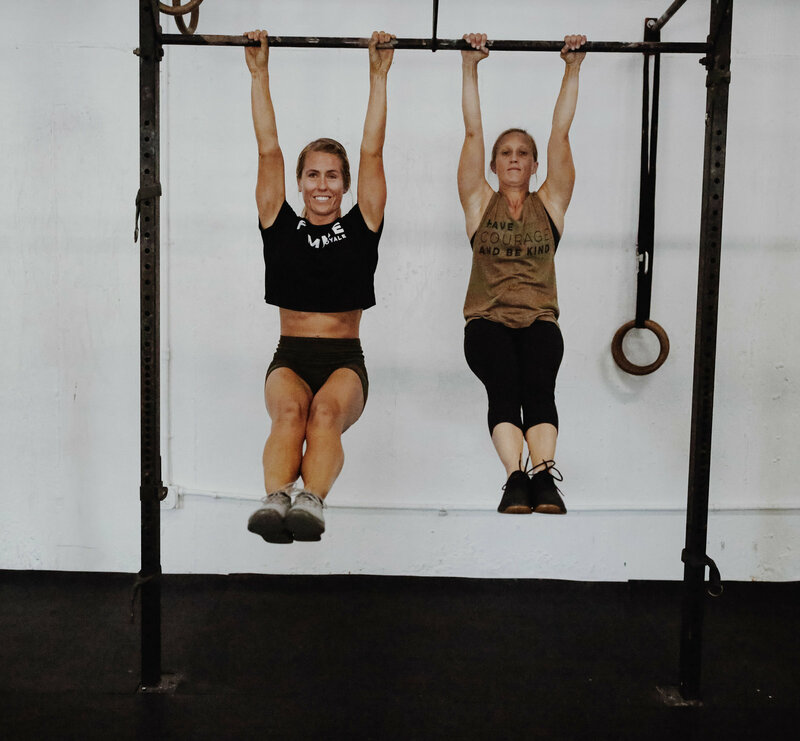 • Once the workout is completed the athletes will work together to complete as many pull ups as possible in the remaining time of the 15 minutes. • If the athletes finish the workout in 13:30, they will have 90 seconds of max effort pull ups. 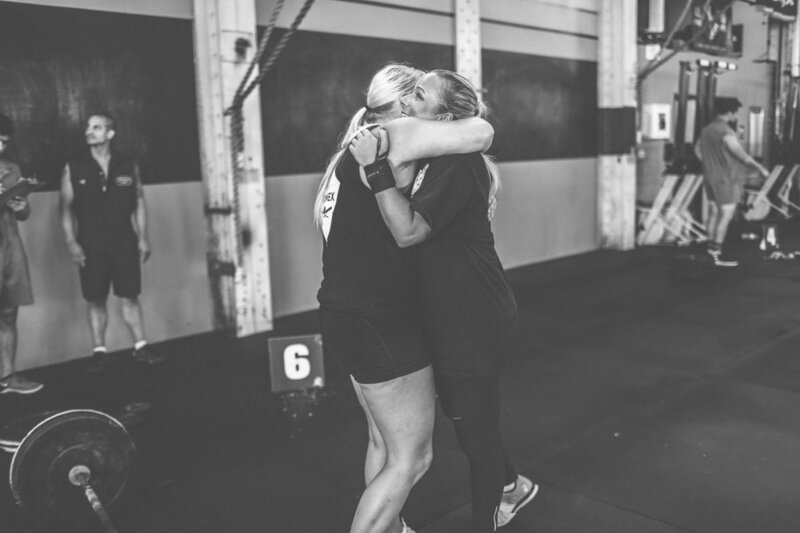 We believe FR competitions are a healthy outlet for women to overcome their fears and doubts. We believe in community over competing against one another. If she wins, we all win. 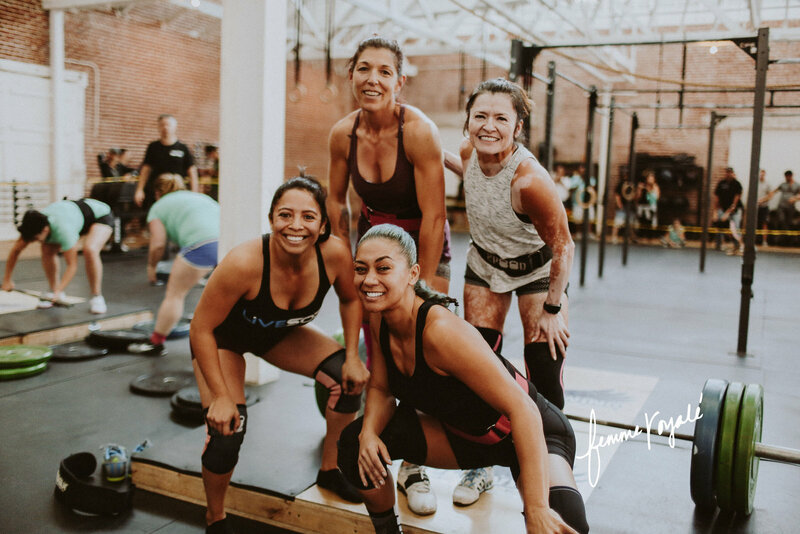 Encouraging, empowering women to push their physical and mental limits. 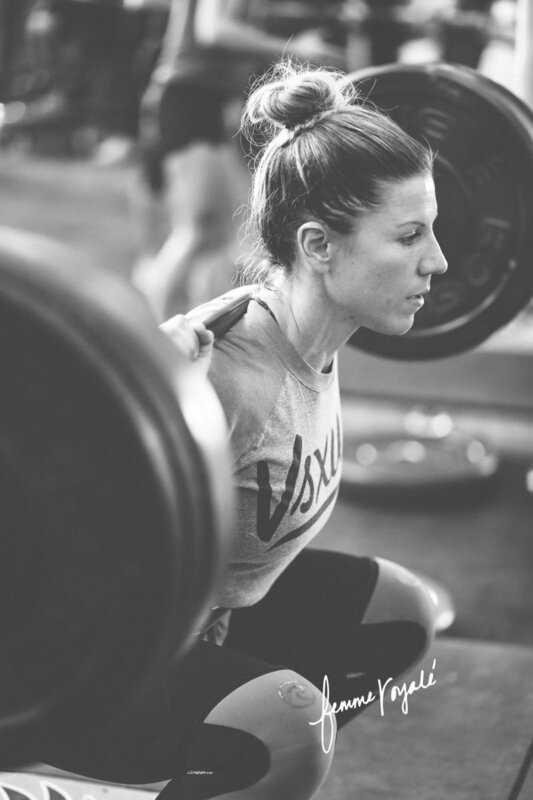 To train for life, because sometimes being strong isn't about the weight on the bar. It's the strength to push through when life knocks us down. Our events are about every athlete competing, not just the elite. We want you to do your best, and leave feeling empowered to take on anything the world throws your way. Our Events are about enjoying life while working hard! THE WOMEN OF OUR GENERATION. THEY DO NOT ACCEPT DEFEAT. WHAT THEY WANT TO BECOME. THEY ARE POWERFUL WOMEN WHO WANT TO CHANGE THE WORLD. 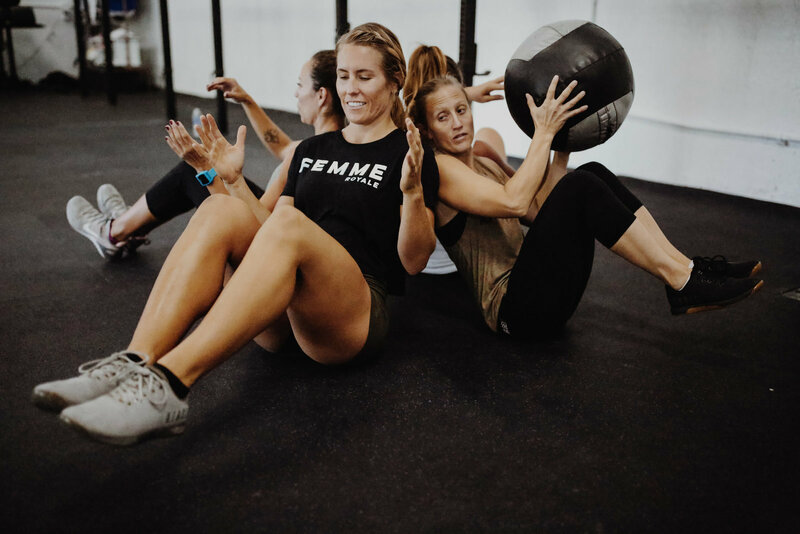 Femme Royale caters to the 98% of women CrossFitters. Our competitions are put on to bring ALL types of women together through competition. 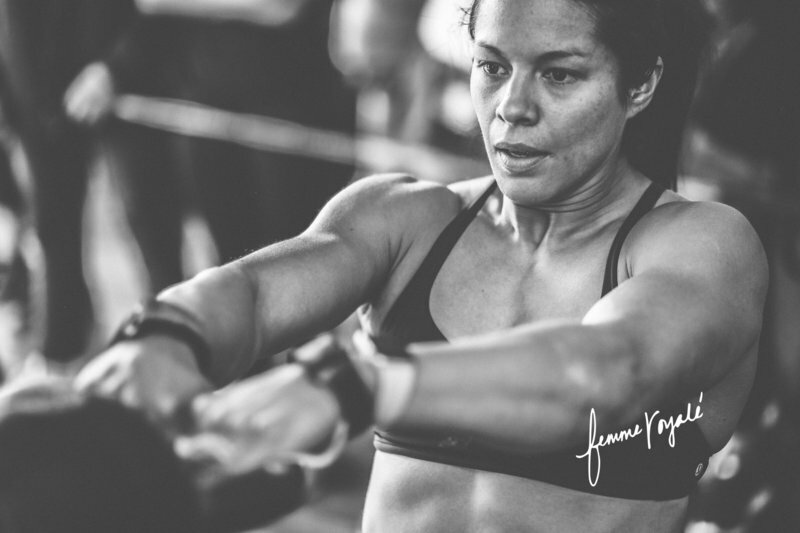 3 partner style workouts, 2 divisions, 1 purpose. It isn't about one girl, but a group of women that share the same powerful vision and passion for life. 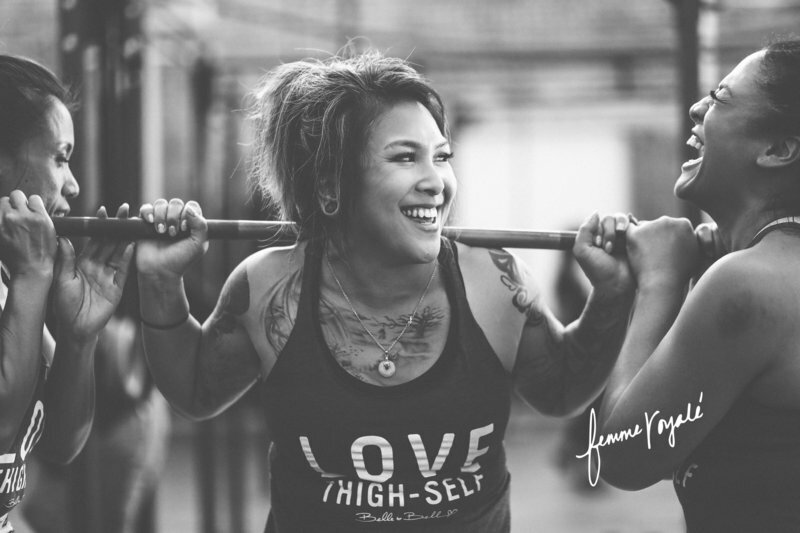 Femme Royale is a platform for women who desire more. 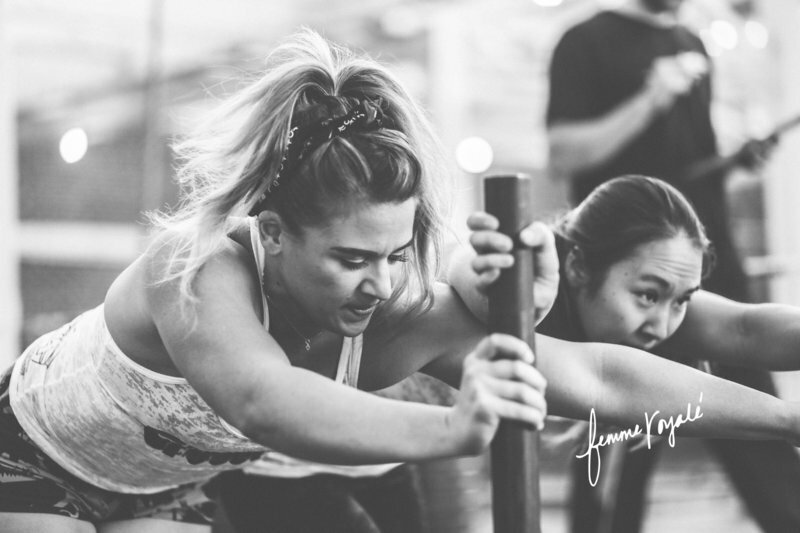 We believe competitions are a healthy outlet for women to learn a lot about themselves. Overcoming what they never thought was possible. An opportunity to adopt new empowering beliefs about themselves. Breakthrough mental limitation, an opportunity to develop a strong work ethic, discipline, and overcome challenges. 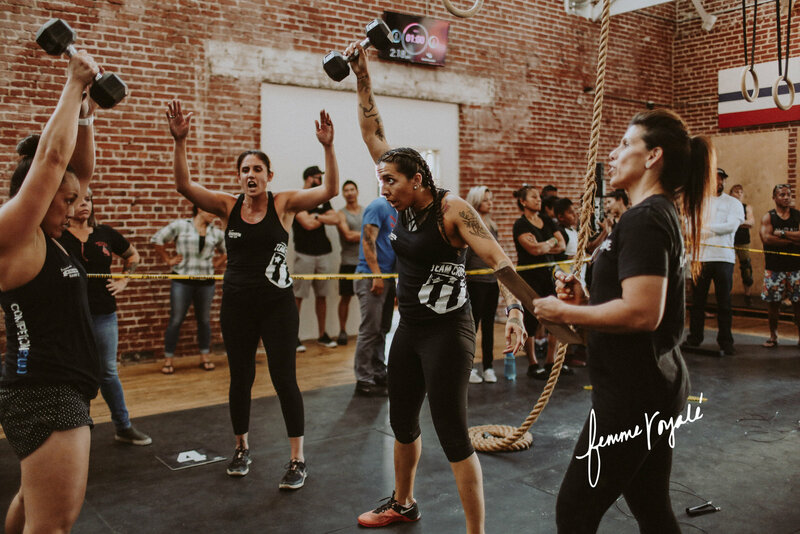 We believe our competitions will help women build a stronger self confidence. Competency for their own life, not only through a physical capacity but in their emotional, mental, spiritual development as well. 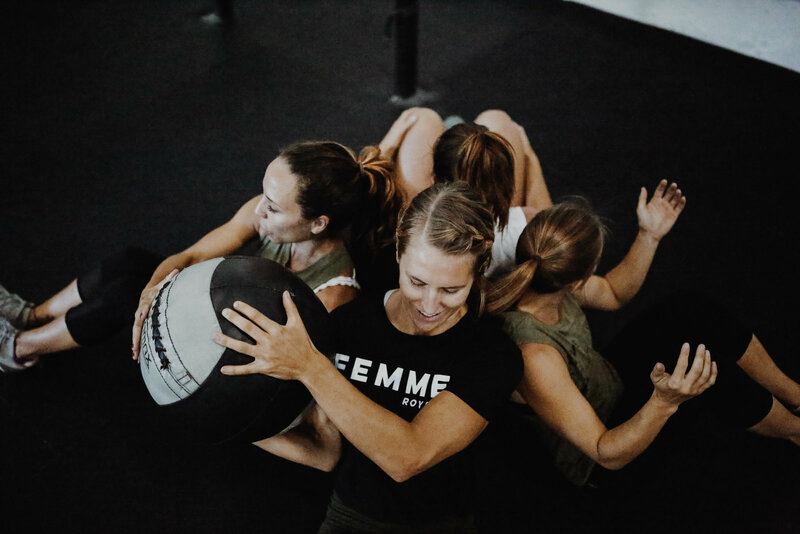 The Femme Royale competitions are perfect for women of all ages and fitness abilities through the use of three categories of competition: the RX Division, the 50/50 Division and the Fun (Scaled) Division. 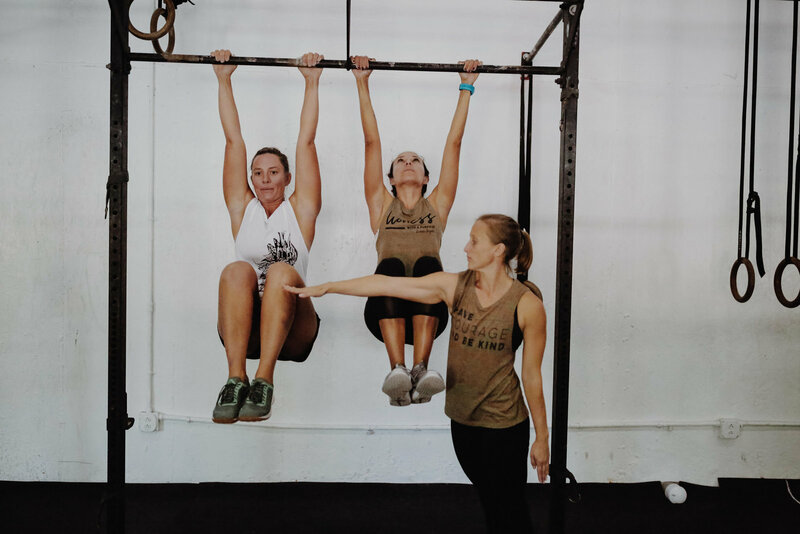 An example of the differences between the three divisions is with pull-ups; many women would like to compete but struggle with stringing together multiple sets of unassisted pull-ups. 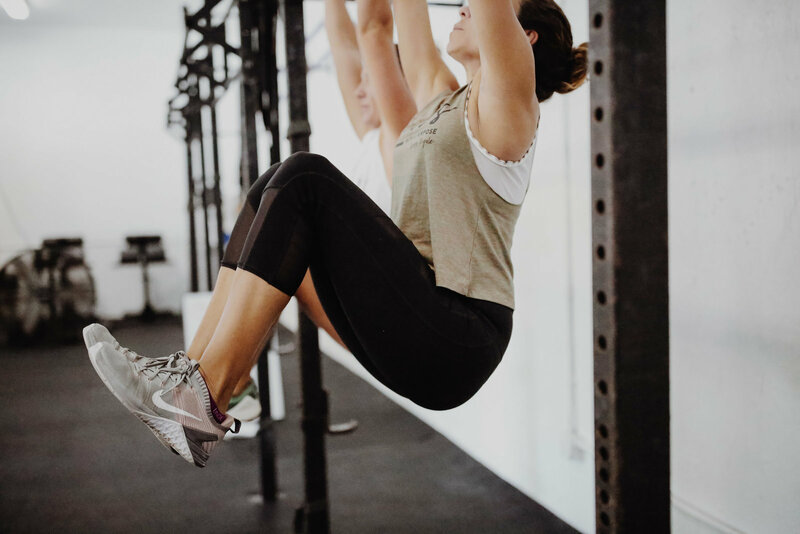 Some can do the more advanced movement such as chest to bar pull ups. Each athlete must be able to do a minimum of ONE rep per the required standards. Example- 10 Muscle Ups Each partner must do one, but can be split up however you choose. Partner 1 does 9, and Partner does 1. 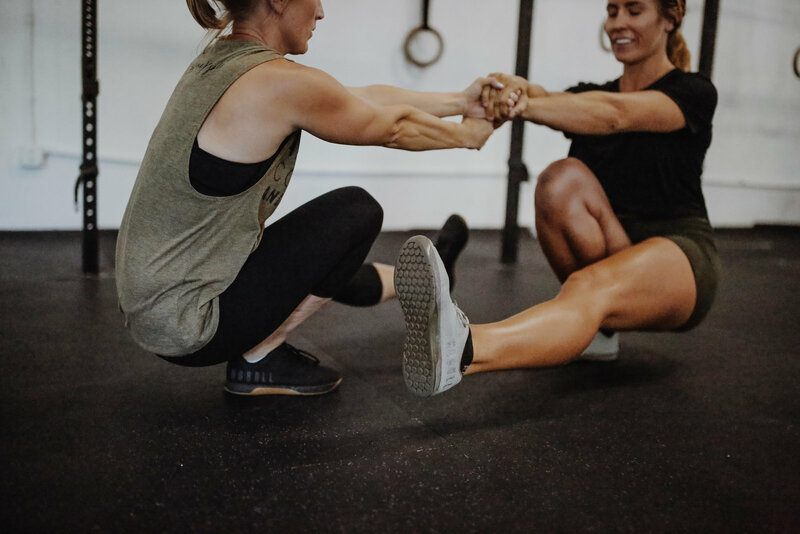 If the movement standards states that it is an alternating movement, such as alternating partner box jumps then each partner will have to do equal amounts of work. No. Only one partner needs to register the team. The entrance team covers both athletes. Please include both athlete's names, emails, affiliations, and tank top. No. We will allow teams to exchange athletes if need be. We understand "things" happen and changes are inevitable so as long it's two weeks prior to the event we will do our best to accommodate your needs. We do NOT offer post event refunds. GREAT! Let Femme Royale be your first competition!! 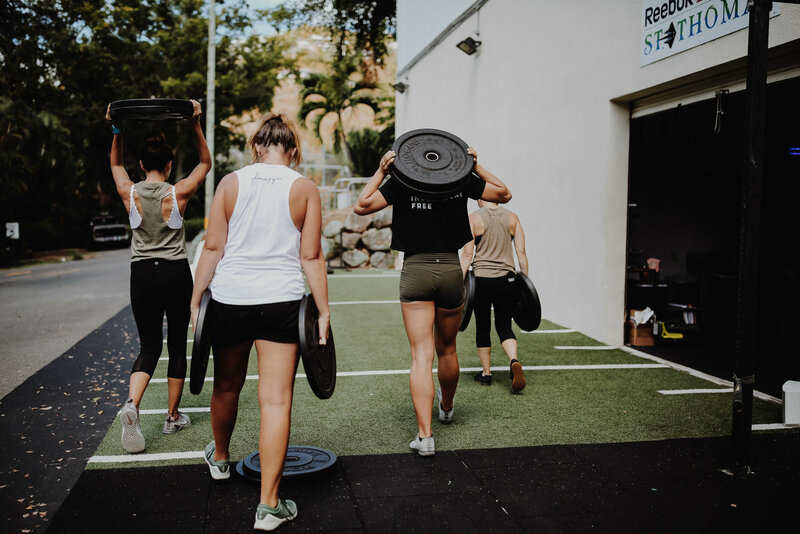 Our goals is to have women of ALL levels competing. 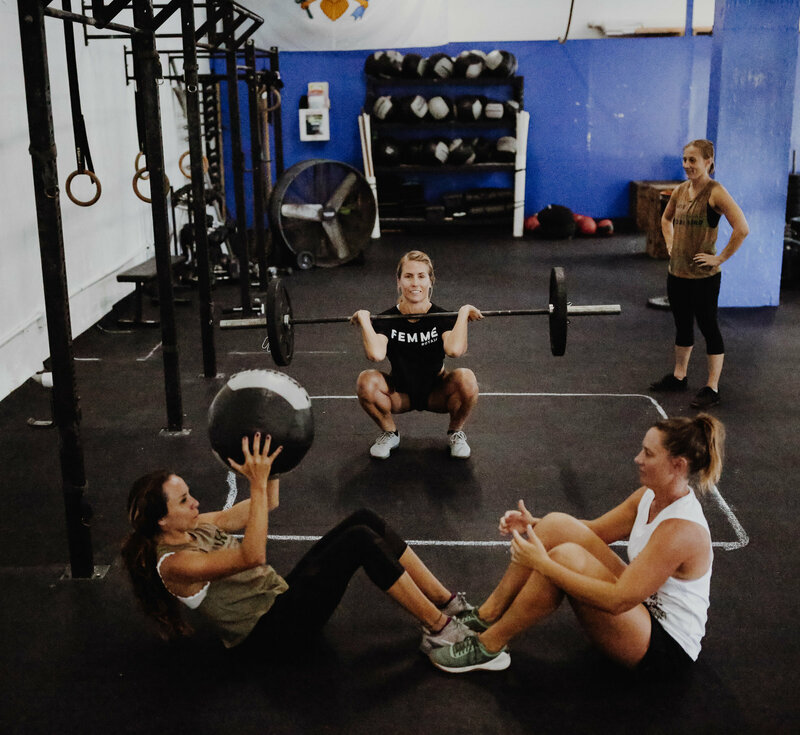 We believe everyone is an athlete, beginner, advanced or even if you just enjoy working out. Our events are meant to be FUN!! Obviously it may be some of the girl's goal to win, but maybe it doesn't have to be your goal. Come out and just have FUN and see what YOU can do. All the heat times and schedule for the event will be sent out the week of the event. No later than Wednesday. Parking details, vendors, and all the little details for the week of the event. We do our best to accommodate all athletes, so we ask for no name changes the week of the event. Must be done minimum of 14 days before the event. We will allow team members to be changed the week of, as we know things come up. Yes we will always have a photographer at our events. @hilarysb is our photographer and she is absolutely amazing. Please do not email about when the photos will be published. We will post them as soon as we get them from our photographers. They do take time to edit and we do ask for a photo of each athlete. So PLEASE understand that doesn't always happen but we do our best to try and make it happen ASAP. All of our athletes will receive goodie bags what will consist of an athlete tank top and various other goodies. We want ALL the athletes to leave with something, versus just the winners of each division. The top three teams of the FUN & 50/50 divisions will receive prizes. For the RX division it is a winner takes all, CASH prize. Are there to keep the competition fair. We hold our athletes to the movement standards to keep an even playing field. If you are competing the FUN division we allow for modifications, ie less weight, movement modifications. But you will be scored behind anyone who didn't modify the movement. Also if you can complete the movement as prescribed and then some, please don't sandbag. Go for the division that will CHALLENGE you!!! Be KIND to our judges, they are there to support all of you competing. They do their best, and we appreciate all their hard work. Without them our events wouldn't be possible. Sh*t happens, we get it. Not often but we may need to change the workout due to equipment or logistical reasons. If this happens, PLEASE don't freak out. We do our best to make sure the day of the event runs smoothly. There is a lot of planning that goes on before, and sometimes we need to change from the original plan.